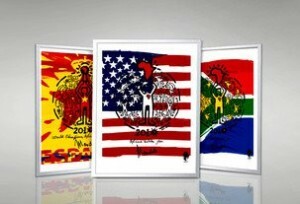 CORE VELOCITY, Inc. announced today that it has partnered with a South African company to take on the North American distribution of Nelson “Madiba” Mandela signed Limited Edition artwork. For more information, please visit Mandela.us or MandelaArt.com. An opportunity to own a part of history. With the support of Nelson Rolihlahla Mandela and the artworks created by renowned South African artist Athol Moult, a project encompassing a series of paintings entitled “Africa Salutes You” has become a beacon of hope for the people of Mvezo. The artwork tells a story of celebration, inspired by the 2010 FIFA World Cup Soccer and the children of Mvezo. The “Africa Salutes You” initiative will help fund development projects in Mvezo. Limited edition hand signed original signature of Nelson Mandela Prints are now available in North America as collector items. You can see the full collection of artwork at Mandela.us and then by clicking on Artwork Collection from the menu. December 5, 2013 – UPDATE: Nelson Mandela passed away today at age 95 (Jul 18, 1918 – Dec 05, 2013). It is with much sadness that we report this news but look back proudly at the hope, courage and strength that Madiba provided and continues to provide to millions of oppressed people throughout the world, even today. The 2010 project was one of Madiba’s last known public projects. We have only a few remaining prints, box sets and large lithographs available for sale, but will continue to keep the website active by providing other South African unique products to the North American marketplace. CORE VELOCITY provides expert JD Edwards consulting services that include both innovative technologies and traditional implementation services. CORE VELOCITY - JD Edwards (JDE) Specialists(TM) work collaboratively to increase ROI on your JD Edwards investment. Learn more here. (c) 2002-2018. CORE VELOCITY, Inc. All Rights Reserved.